Congratulation! You are currently on the right path! As a content marketer, apart from knowing how to write good content for your website, it is crucial for you to have a few basic knowledge on SEO. Well, let’s learn what On-Site SEO is all about. Search Engine Optimization, which is also known as SEO is a strategy to make websites or blogs ranked in search results. This is where it needs the consistency and ongoing optimizing of websites and blog posts for your business. It is important to your business for people to easily find your company or business by only searching in a phrase or keyword in the search engine. This is because it can make or break a company due to search results in the search engine. When someone is searching for any specific terms or keyword in the search engine, Google will only show 10 organic results on the first page. The ranks are based on a number of factors like the number of backlinks, site speed, bounce rate, and many others. Therefore, it is very important for your company to appear at least in the first page of the search engine when people search it. Furthermore, it is not only for vanity but also better positioning increase chances of improved awareness, traffic and authority. 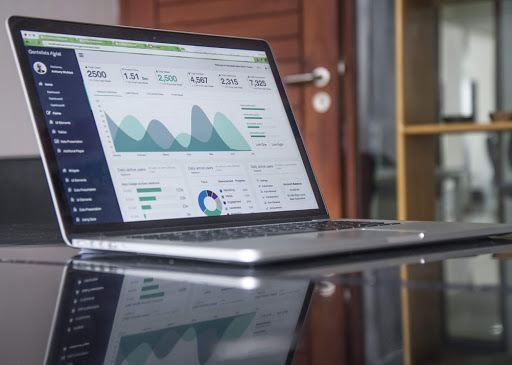 It is true that SEO is a strategy to make your website get better ranking at Google, however are you sure that your site is really optimized? Best of the best? And in the top ranking? If the answer is “NOT”, then you should continue reading this article. Below are the essential strategies of On-Site SEO techniques which you can follow to make your site get better ranking in Google. 1. Write a unique and high-quality content for your article. It is not the aesthetic value alone that causes users to visit your website for the second time. However, the key element is the quality of the content. The more relevant the content to the current issue, you may receive more traffic than you ever expected. It is crucial to maintain a good SEO rank for your site by developing unique contents for your content writing. By avoiding the duplicated content you will be able to focus on which page you want to rank for. In addition, it will also help the search engine result page (SERPs) to determine which page you want to consider as the landing page. Hence, your article will not have to compete with other articles which might be discussing the same topic. Meanwhile, in-depth writing is important in turning your articles into more informative and attractive to the users. You might receive organic clicks from the users due to great contents. Besides, prevent your articles from turning into plain articles, give the page some link building with other high-quality sites. It will be worth it. Give it a try now! Need to learn from the beginning? Sure, you may learn how to build link here. Obviously high-quality content will also help your keywords’ rank to maintain higher ranking longer than usual. Is this possible? This special factor will help you generate sales as users had already put their trust on your credibility. Hence, users have the confidence to share the articles more often on their social media. As you start to write your content, always remember the relevance of sticking to the topic and target keyword that you’ve picked earlier..
Don’t try to write about everything and anything within a single piece of content. And don’t try to target dozens of keywords. Composing a high-quality content for your article is never simple, however, it turns out to be much easier when you compose something that you’re passionate about. When you compose something interesting, after a few years from now, it will still be viewed, read and shared by other people. Based on that, it brings traffic back to your site. Alt text which stands for alternative text, is a small piece of text that is used to describe an image, chart, photograph, or any other picture on a website. 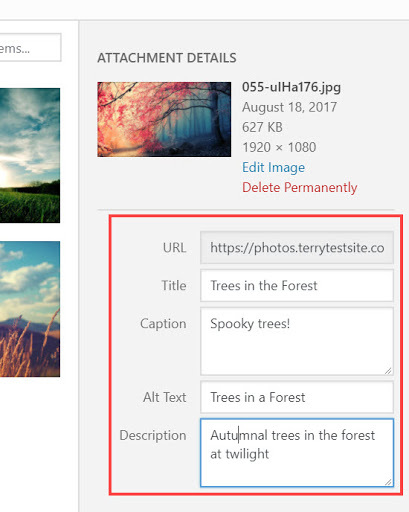 Alt text allows search bots to understand the context of your images in which they are placed, and thus the image can index more accurately. Providing alt-tag for the images will also lead to a good user experience apart from keeping the website mobile-friendly. On this note, the web page will have the chance to rank higher in SERP. 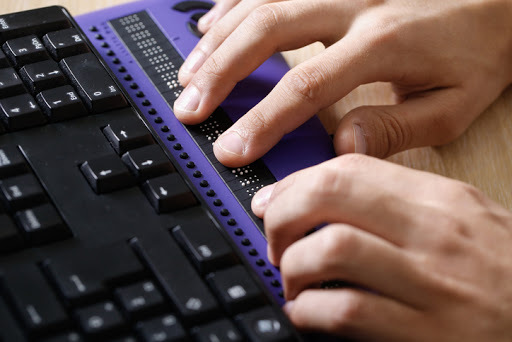 Screen readers is a type of user interaction device used by the users with sight-disabilities. The device will only able to translate the information from the images with the aid of alt-tag. Hence, we could see that alt-tag is needed to describe images and help in improving the user experience. Do you need additional tips for your images optimization? Do you know that search engine also crawl your images apart from the texts? (You may skip this line if you are not interested with it). Use plain language as the filename of images. For instance, the original filename is RTGHBBBVCFDXRTVI.jpeg and you should turn it into a meaningful name such as rabbit.jpeg. This is because users will usually search for the words they already know from the search engine. Hence, your image might get higher potential to be listed along with other images from different websites. Carefully utilize the alt attribute. Name the alt attribute with meaningful words or sentences, include the model or serial number of the product such as “iphone-5s” and do not mixed it with a bunch of other keywords. Also, do not use the alt attribute for your decorative image to avoid being penalized by the search engine. Provide different angle or dimension of the products. You still need to name it with a meaningful name. However, you need to make it more specific this time. For example “iphone-5s-gold”, “iphone-6-front” and other related name. Use small images on the blog post. This is to prevent your website from taking too much time to load the pages. However, you can still enable your web visitors to view the larger images at different tab or browser by customizing some CSS codes. After finishing your keyword research, you may start by implementing the keywords at the title tag. Furthermore, a unique and interesting title tag also helps the target page to improve its search engine ranking. Next, the search engine will analyze the title tag of web pages that related to the keyword phrases searched by the users. Then, it will let the pages appear at the top of the search results. Add action words into the title-tag is another skill you need to master. However, you still need to maintain the length of the title tag within 60-70 characters. Your title should be meaningful, well optimized, and relevant to your landing page. Be descriptive of what’s on the page. Do not put multiple keywords into the title. Another significant element to be included on your website is the meta description. It is important to use natural language, active and non-spammy words to attract users to visit the web page. 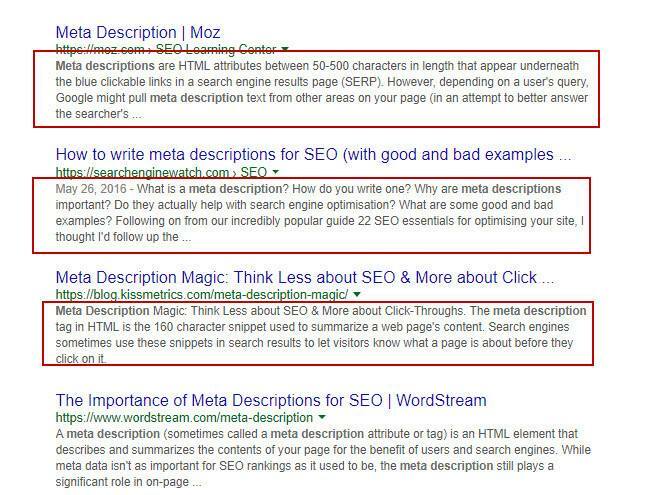 For more clarification, meta description is a text of a short paragraph that appears under the URL page in the search result. It is where it describes the content of the website you have done. This is also known as a snippet. A well keyword-optimized meta description can provide better clarity to the users about your page and also help search engines to understand the information stored on your landing page. Therefore, you should write a description of your content in an interesting way so that people will find it is interesting enough to be clicked. To enable the search engine to determine your pages content faster, you need to include the targeted keywords in the meta description. Plus, the Click-Through Rate (CTR) of a page will increase if the contents meet the users’ requirements. If you are using the same meta description for each page, at least change one single keyword. Long descriptions may be truncated by Google. Keywords help your site get listed in the search results. Keep the description under 160 characters. Provide a short, specific overview of what the content is about. Include relevant or target keywords which will be highlighted in the search page result when a user search the keyword in the search engine. Heading tags are HTML tags used to identify headings and subheadings within your content. The hierarchy goes from H1 to H6. One of the most effective SEO strategies is utilizing the heading tags with the short-tail and the long-tail keywords. 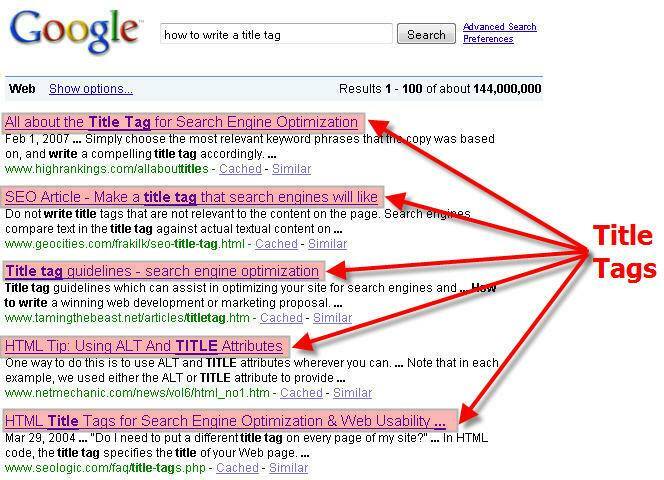 H1 tag should concentrate on keyword that closely related with the page title and applicable for the webpage content. Meanwhile, the other tags should be the supporting point for the H1 tag. Do you notice that most of the website using the same name for the title tag and h1 tag? However, those two things are different from each other. Click here and learn the difference. The existence of H1 tag enable the search engine to locate the related web page in just a few seconds. 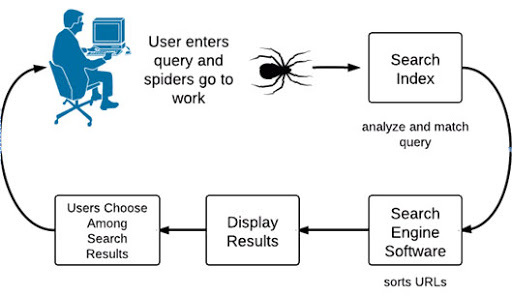 Search engine spiders are used to rebuild or index websites by Google and other search engines. Meanwhile, the spiders will definitely focus on the content wrapped in H1 header tags. Crawling restraints such as the number of parameters in a URL. All these requirements can be fulfilled by playing with the suitable font family, font size and style such as bold, italic and underline. Trust me, it’s a piece of cake! Moreover, it needs to stress that, H1 is enough to be used only one in a page. It is because Google looks at H1 tags as clues to what the page’s content is about. Therefore, if you have multiple H1 tags with different keywords in a page, then it is difficult for Google to contextualize the page. Then, for section breaks, you can stick to H2 and H3 tags. However, do not use too many H2 or H3 tags in a page as Google’s algorithms won’t like that. Best practice: Used only one h1 tag with the keyword or theme you are trying to optimize for. Let’s do a recap on the secret ingredients before we end our discussion. Believe it or not, these factors play into SEO ranking more than you think! Be sure that your content is following above suggestions, otherwise, you may see a high bounce rate, which can signal to search engines that your page isn’t offering value. Enhancing your site’s search engine traffic activity is not that simple. Try not to consider getting fast outcomes with SEO. Instead, focus on getting consistent, reliable and long-term results. If you implement all the key SEO techniques mentioned in this guide, you will definitely see a major traffic spike. What do you think is the best on-site SEO technique? Share with us how you get better ranking at Google. Looking forward to be hearing from you! All the best and never give up!